Quantum physic can guarantee that a message has not be intercepted before reaching its destination. Thanks to the laws of quantum physic, a particle of light – a photon – can be in two distinct states simultaneously, comparable to a coin thrown in the air, which is virtually both head and tail before reaching the ground. Like when the coin is grabbed, this superposition of states is destroyed as soon as it is read. This peculiar feature allow one to detect an evil eavesdropper when sending a message. However, this technique is so far limited to short distances. In order to extend the reach of these quantum communications, researchers from the University of Geneva (UNIGE), Switzerland, have demonstrated a novel protocol based on a crystal than can emit quantum light as well as store it for arbitrary long times. This work, to appear in Physical Review Letters, paves the way for a future quantum repeater. Quantum superposition is one of the fascinating features of quantum physic. "In order to test the security of communication link, we can use particles of light, photons, onto which we encode quantum bits (analogous to the bit used in computing)," explains Cyril Laplane, a researcher in the Group of Applied Physics at UNIGE. He continues: "We then take advantage of the properties of quantum superposition, allowing the photon to be simultaneously in two states, to test the security of a communication link". Indeed if the photon is intercepted and read, the superposition of states is lost, only one of the two states remains. Hence, the recipient can know if the message has been intercepted. 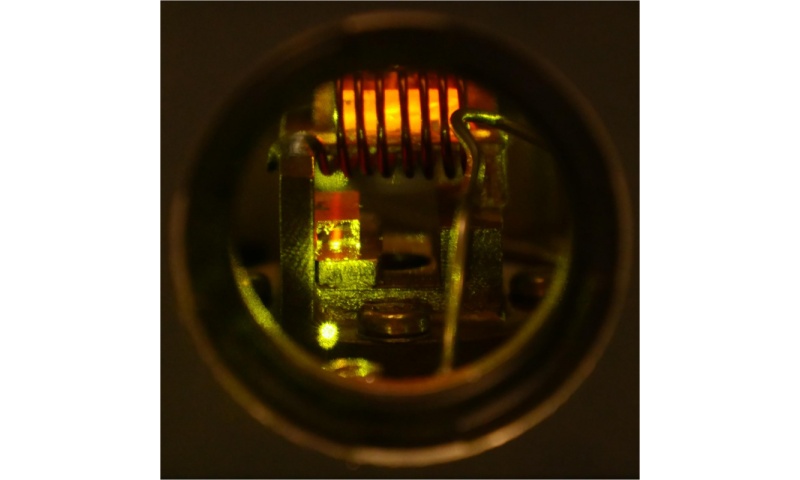 To build a quantum repeater, scientists have investigated a lot atomic gases, which usually require heavy experimental apparatus. "We are using a crystal capable of storing quantum state of light. It possesses the advantage of being relatively simple to use with potential for very long storage times," clarifies Jean Etesse, a co-author of the paper. These crystals are able to absorb light and restore it later, without reading the information encoded on it. Furthermore, they can generate single photons and store them on demand. Another major asset is their potential for miniaturisation.